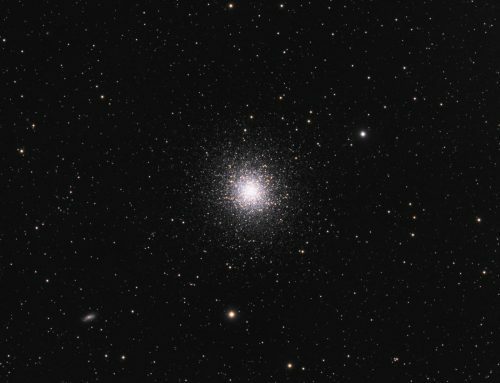 There are two main types of star clusters: “open clusters” (OC) and “globular clusters” (GC). OCs are also sometimes called “galactic clusters,” and usually contain a few dozen to a couple thousand stars. OCs reside in the main spiral arms of our galaxy, the Milky Way. GCs contain hundreds of thousands to millions of stars, are usually quite densely packed, and form a halo around the Milky Way galaxy (other galaxies also have GCs). 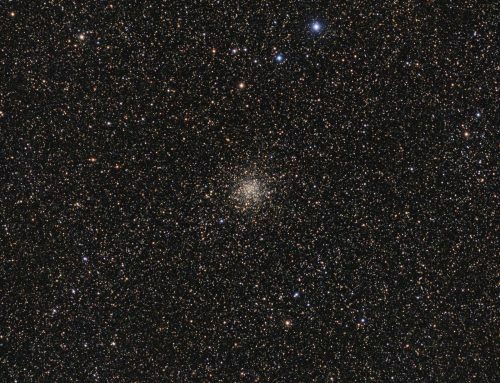 The object at the centre of this image is M71. For a long time, M71 was classified as an OC. However now it’s known to be a rather loosely packed GC, located about 12,000 light years from us. 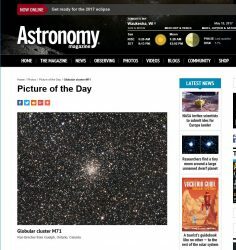 To me it looks like a GC when I look through an eyepiece, but some images make it look more like a rich open cluster (e.g. 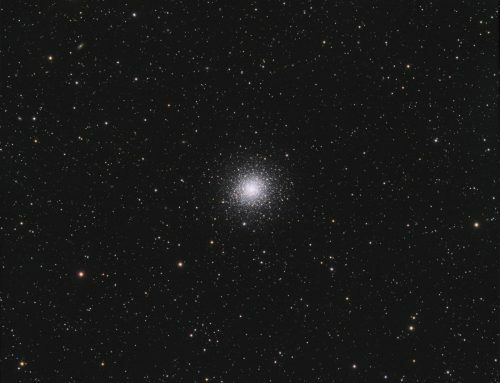 M11). It is about 27 light years across, and relatively young at around 9 or 10 billion years old. 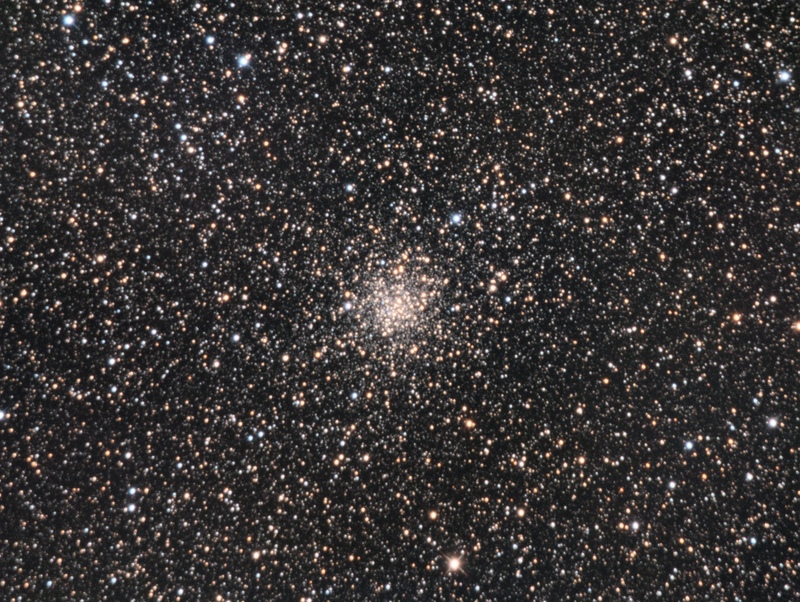 It has the mass of around 17,000 suns and the luminosity (basically, brightness) of around 13,000 suns. I love the rich Milky Way star field surrounding the cluster. The data for this image was acquired in the summer of 2014, and it has been reprocessed. This is one of very few pictures that I have pubished that was taken using an 8″-RC telescope. I didn’t keep it long because I was not perfectly happy with the star images. QSI583wsg camera, Astrodon RGB filters, 8″ f/8 RC telescope, MI-250 mount. 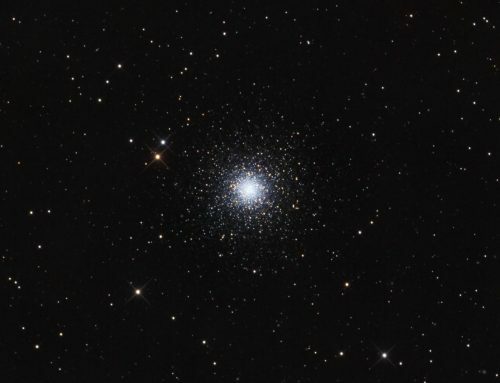 Guided with QHY5 and 80 mm f/6 refractor. Acquisition and guiding with Maxim DL. All pre-processing and processing in PixInsight. Shot from my SkyShed in Guelph, Ontario. No moon. Good transparency and seeing throughout. 6x15m and 3x10m R and G; 7x15m and 3x10mB, all unbinned frames (total=6hr15m). Creation and cleanup: R, G and B masters were cropped, combined with ChannelCombination and the RGB was processed with DBE and ColorCalibration. Linear Noise Reduction: MultiscaleLinearTransform was used to reduce noise in the background areas. A Linear mask and the following Layer settings for threshold and strength were used: Layer 1: 3.0, 0.75 Layer 2: 2.5, 0.62 Layer 3: 2.0, 0.5 Layer 4: 0.5, 0.2, Layer 5: 0.5, 0.1. Stretching: HistogramTransformation was applied to make a pleasing yet bright image. Creation and cleanup of SynthL: The cleaned up R, G and B masters were combined using ImageIntegration (average, additive with scaling, noise evaluation, iterative K-sigma / biweight midvariance, no pixel rejection). Nonlinear Noise Reduction: TGVDenoise was applied with a mask to protect stars. The image was re-stretched to reset the black point. The luminance channel of the RGB image was applied with LRGBCombine to make a SynthLRGB image. Colour noise reduction was used at default settings. Background and star brightness, contrast and saturation were adjusted in several iterations using Curves with masks as required. Image scale is about 1.4 arcseconds per pixel.